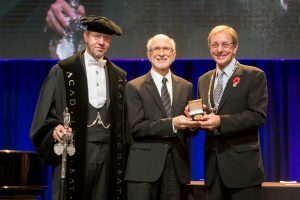 Accepting the Leonardo da Vinci World Award of Arts medal from Sir Colin Blakemore. On November 8th, Russell received the World Award of Arts from the World Cultural Council. The ceremony took place at the University of Leiden in the Netherlands. As part of the ceremony, a short video about Russell was shown that included interview clips with Russell himself and comments from Steve Reich and others. The 15 minute segment of the ceremony, including Russell’s excellent acceptance speech, is available HERE. 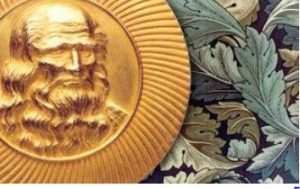 (Click on the Da Vinci Award section.) The presentation is followed by an unusual percussion performance! We were moved by Russell’s words in his acceptance speech when he thanked his NEXUS colleagues who “inspired me by showing me how to love every sound I make!” We could not ask for a greater tribute. As part of the event, Russell gave a lecture earlier in the day, where he explained how he conducts research “on the infectiousness of different drum rhythms and how senses and muscles work together to play a beat”. He used music by Steve Reich and West African drums to demonstrate. We are looking forward to hearing more from Russell himself about the festivities and we are hoping to be able to post the lecture here on the NEXUS blog for your interest. 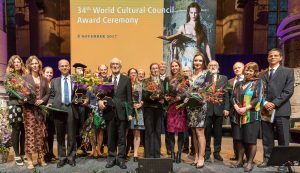 You can read more about the WCC and its awards and the day’s events in this article. Russell Hartenberger receives the 2017 Leonardo da Vinci World Award of Arts! Colleague Russell Hartenberger wins big time!